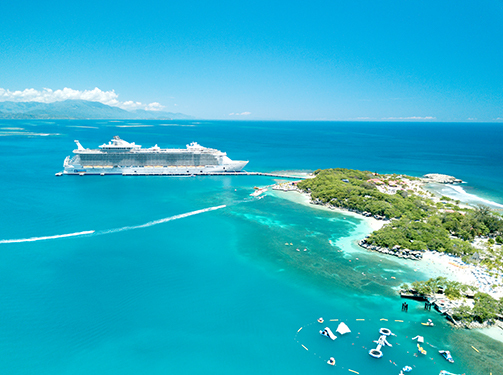 Royal Caribbean’s Allure of the Seas is the most awarded cruise ship in the world. Read more about the Allure of the Seas here. On the Allure of the Seas, you’ll be looking forward to those sea days as you uncover everything this spectacular ship has to offer. As part of the Royal Caribbean’s Oasis Class, this ship is sure to impress. Stroll through 7 unique neighborhoods, take a dip in one of four pools, dine at one of 25 restaurants and lounges and enjoy world-class entertainment at the indoor theater, outdoor Aquatheater or the ice rink. The excitement doesn’t stop there though. Take a thrilling ride on the Allure’s zipline, climb the rock wall, surf the waves of the FlowRider or play a leisurely round of mini golf. If health and wellness is more what you had in mind, the Allure has that too. Visit the Vitality Spa and indulge in a variety of unique massage treatments, take a fitness class, visit the salon or take an enrichment seminar to emerge renewed and energized. Visit Royal Caribbean’s website for more information.